Just look how messy I am! This photo of my cluttered writing desk says it all. Here is where I beaver away writing my masterpiece novel, which will one day catapult me to fame and fortune (I wish). Yes, but hang on, let’s be fair. I can organise the clutter in my mind. When writing, whether academic essays or creative writing, I find I can tidy up my mind, weed out the irrelevancies and put things in order, giving a pleasing shape and structure to the topic in hand. I enjoy doing that. Making sense out of a jumble of ideas. It’s easier to sort out what I think and feel about something when I write it all out of me. In writing short stories or a novel, my first draft is untidy. I don’t write a plot outline in great detail before I begin (or if I do, I tend not to stick to it). I just need the bare bones and the basic idea, and then off I go, adapting and changing it as I go along. With each edit, it gets more organised. Jean Rhys once pointed out that a novel must have shape, and real life usually has none. I think memoir writing is, in some ways, more difficult than writing fiction. In memoir writing, we do still have to give a shape to our life events and set down the material in a readable form. However, in so doing, we need to take care to keep rooted in the facts of what actually happened. Unlike with writing fiction, we can’t allow our imagination to soar. What’s wrong with an untidy writing desk, then? I can answer that by saying it’s so annoying when you can’t find your pen or the particular paper you need. For practical purposes and to make life easier, I MUST tidy up my desk. But I wouldn’t go so far as to agree that ‘a clean desk sends the message that you’re organised and accomplished, while a dishevelled one implies that your life is in a similar state.’ (That’s a quote I once jotted down, but, sorry, I don’t know who said it). And remember that great thinkers such as Albert Einstein and Roald Dahl had untidy desks. So there! We untidy deskers are in good company. ‘If a cluttered desk is a sign of a cluttered mind, of what, then, is an empty desk a sign?’ – Einstein. 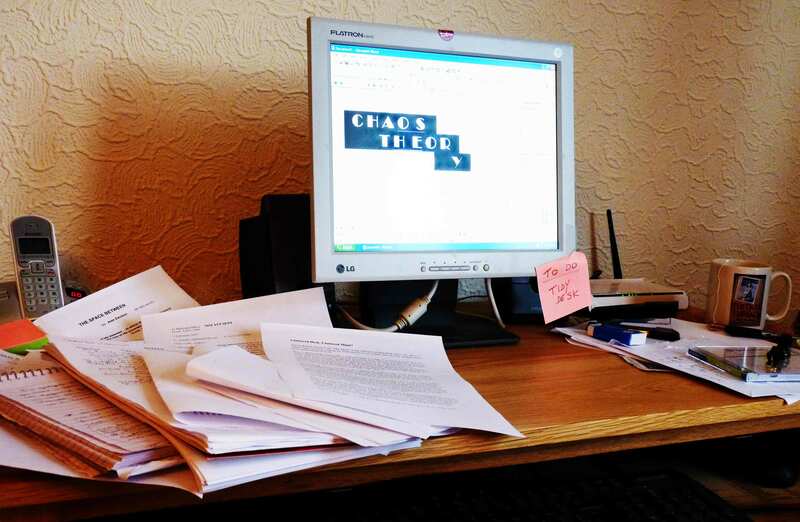 This entry was posted in Writing and tagged chaos, clutter, Dahl, desk, Einstein, Kate Millett, messy, mind, order, papers, Rhys, untidy, writing desk by Jean Davison. Bookmark the permalink. Well said, Einstein! My desk gets more and more cluttered, and then I clear it up and it looks tidy for a while. I wonder what that says about my mind…. Me too. I do keep clearing it up but then it’s soon back to being as untidy as ever. My house never seems to stay tidy for long. Too many distractions that are more appealing than housework! That is a really nice post Jean. I love this: Jean Rhys once pointed out that a novel must have shape, and real life usually has none. It had never crossed my mind before, but it’s so true. Also I identify with a mind with thoughts shooting off in different directions. Oh but BTW that desk doesn’t seem that untidy, it actually seems quite organised to me!!! Thanks, Vicky. My desk often does get more untidy than that. I’d just cleared that space in the middle to rest my elbow on while I thought up a topic for a blog post!